Jane Olson has devoted her life to international justice and humanitarian work. 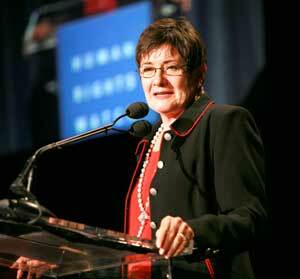 She chairs the International Board of Human Rights Watch and also chairs the board of Landmine Survivors Network. She recently joined the board of the Pacific Council on International Policy and is a member of the Council on Foreign Relations. Jane has received numerous awards, including the inaugural 2005 Eleanor Roosevelt Award from Feminist Majority; the Silver Achievement Award from the YWCA of Greater Los Angeles; and the Community Achievement Award from Public Counsel. She and her husband, attorney Ronald L. Olson, reside in Pasadena, CA. They have three grown children and eight grandsons.